Bringing dental care into the modern age. At Robert F. Walker Jr. DDS, we are committed to providing excellent dentistry built around your best comfort and care. Implementing the latest in dental treatments and innovations, such as laser dentistry for our Chandler, AZ patients, is just one of the many ways we accomplish this. The use of a soft-tissue laser allows Dr. Walker to provide dental care with the most precision and little-to-no discomfort. Many treatments that were previously only possible with the use of a scalpel are much more convenient and comfortable with laser dentistry! Dr. Walker is fully qualified and proficient in laser dentistry, so you can rest assured you are in good hands. Dr. Walker and our team proudly stay on top of today’s dental advancements so you receive safe and comfortable dentistry. Using a laser makes treatment quick and gentle while providing many other benefits. 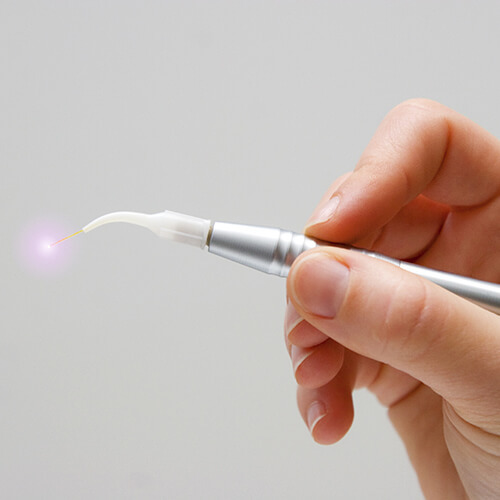 Laser dentistry is virtually painless, reducing the need for sedation or other anesthetics. As Dr. Walker treats an area with the laser, the tissue becomes sterilized and begins to heal itself on the spot. These properties mean minimal bleeding and a much faster healing time, post-treatment. Our family has gone to Dr. Walker's office for many years. We like his office so much we continued to go to his practice even when we moved up to Scottsdale 13 years ago! He keeps current with all the latest practices and equipment so that he can offer the best treatment/care. He gets the job done right the first time. We recommend him highly!